The Captivated women’s summer series begins on June 15th and will run every Thursday through the end of July. Sessions will be held Thursdays at 11 a.m.-12 p.m. and evenings at 6 p.m.-7 p.m. at the Cincinnati Art Museum. Each week you will read and reflect on a Bible narrative in advance and then visit the art museum. You’ll be given instructions as you enter the museum to locate the related masterpiece and time to view and reflect. 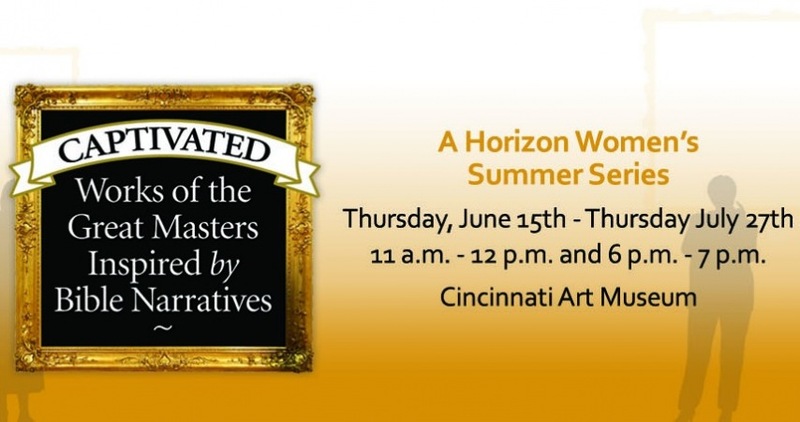 A docent from the museum will discuss the history of the piece and a Horizon pastor will close the time together with a brief message related to the narrative. Feel free to attend only those dates and times that your schedule permits. The Captivated events are held at the Cincinnati Art Museum. If you’d like to view the artwork in advance, click on the "View the Artwork" button below. General Admission and parking are free. Doors open at 11 a.m. and close at 8 p.m. on Thursdays. Allow time to meet at the Visitor’s Service Desk at the main entrance to the museum to check-in and make your way to the assigned gallery. A complimentary gallery seat will be available for you to take to the assigned gallery. Accessible parking spaces and an access ramp are available near the DeWitt Entrance, located at the rear of the museum. Consider getting a bite at the Terrace Café located in the museum. The Terrace Café is open on Thursdays from 11a.m.-7:30p.m. For reservations call (513) 639-2986. Or, there are many other restaurants to choose from in and near the Mt. Adams area. Questions? Contact Tammy Hill at thill@horizoncc.com or call 513 272-5800, ext. 244. There is no cost associated with the Captivated events.